XShot (ZURU) Free Giveaway, Exclusively at BlasterHub! Blaster Hub teams up with ZURU for X-Shot prizes! (UPDATE) This giveaway is done and the winners have been chosen! Looking to try out some of the newest X-Shot blasters? 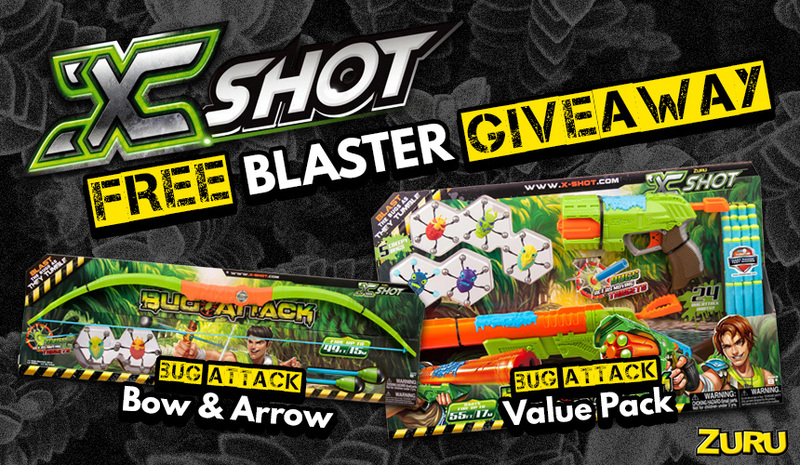 Here’s a chance to win one of two, new X-Shot Bug Attack packs in our exclusive giveaway! We’ve been fans of ZURU’s high-value X-Shot blasters for some time, and the Bug Attack line is an exciting addition, with wood-look handle grips, faux metal trigger guards, a unique color scheme, and of course the “creepy bugs” that act as moving targets. Now ZURU has expanded the line with the Bug Attack Value Pack, and the all-new Bug Attack Bug Blaster Bow & Arrow set. We’d like to thank Zuru for their support, and we look forward to sharing ongoing news and reviews of their products with Blaster Hub readers. In the meantime, here’s how you can win one of the two, brand-new ZURU X-Shot Bug Attack sets shown below! Rapid Fire Dart Blaster: The wall crawlers have invaded and the only way to defeat them is with the X Shot Bug Attack Eliminator. The double barrel blaster comes with a pump action handle and shoots darts up to 55ft! Stop the included wall crawlers in their tracks as they make their wall down the wall! Eliminator Dart Blaster: Creepeez and wall crawlers have invaded and only the X-Shot Bug Attack Rapid Fire Blaster can blast them away with total accuracy! Unload the Rapid Fire Blaster 6 dart barrel in less than 30 seconds and watch the bugs fall from the wall! 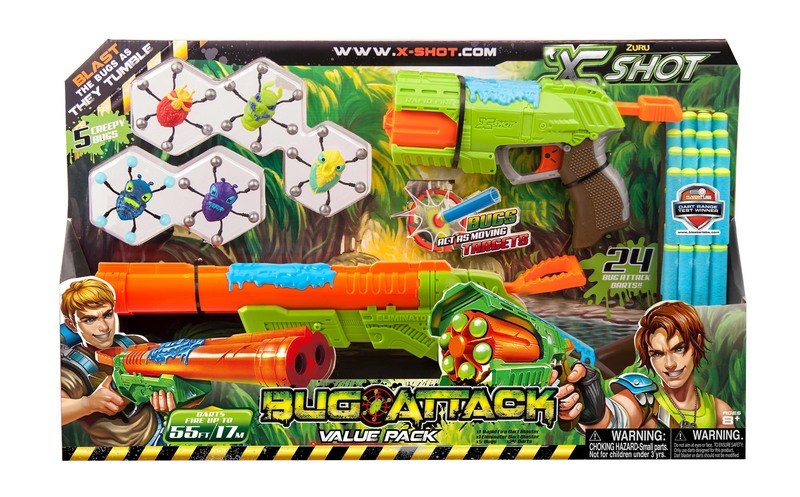 Bug Attack Rapid Fire fires from a multi-load barrel and will fire darts up to 55ft! What is required to win? In total, you have the chance to get seven (7) opportunities to win! What is the free giveaway deadline? This giveaway finished at midnight EST, August 19th, 2016. We then randomly selected one person (per prize) who completed any of the possible entry methods above, and got in contact with them to obtain their shipping information. From here, our contact at X-Shot will send the prizes to their provided address directly. Any questions? Thoughts about X-Shot? Fire away in the comments section below! This entry was posted in Blaster Hub: Exclusive, Contests, Dart Blasters and tagged blasterhub, blaters, exclusive, free, giveaway, xshot, zuru on July 27, 2016 by PStevenson. Done, done aaand done! Thank you Blasterhub & Zuru guys! you’re awesome!! You are welcome! This is a little way to give back to the fans, and we hope the winners in this giveaway will be able to enjoy their free item! We have chosen our winners, and will be reaching out to them to confirm!